An orofacial injury, which is injury to the mouth or face, is common among athletes, as studies indicate that they have 33 – 56 percent chance of sustaining this kind of injury at some point in their playing career. For this reason, the American Dental Association and the Academy for Sports Dentistry recommend that athletes who participate in contact and collision sports have a professionally-made, properly-fitted custom mouthguard. The recommendation did not end there, as another leading organization; NATA (National Association of Athletic Trainers) recently released a new position statement talking of dental injuries. In the statement, they included such factors as recommendations on emergency planning, dental classification, and education for creating awareness on both the effectiveness and how to care for a mouthguard. NATA represents and supports over 44,000 members of the athletic training profession, and their recommendation on mouthguard effectiveness and care is primarily focused on athletic trainers. However, every athlete, parent, and coach will find NATA’s recommendations for mouthguard effectiveness, care, material and fabrication to be of great importance. In a statement released by NATA, mouthguards are ever useful and effective when it comes to preventing orofacial injuries. Athletes, especially the ones who participate in sports activities with increased risk of orofacial injuries, are, therefore, encouraged to wear properly fitted mouthguards. It is obvious that for your mouthguard to work, you have to wear it. And according to NATA, mouthguards should be comfortable if they were to meet any compliance. The ones that are not compliant are those that are likely to cause nausea, dyspnea, oral dryness, and speaking difficulty. Furthermore, they are hard, bulky, and stable. More than a few athletes who have used non-compliant or rather the wrong mouthguards have complained of these mouthguards’ bulkiness and discomfort, which have made the mouthguards to muddle speech and restrict breathing. A mouthguard with correct cuts does not have any unnecessary/unwanted material in places it’s not meant to be. For instance, the soft palate area (the fleshy, flexible part toward the roof of the mouth) of a compliant mouthguard should not have any material. That is because the addition of any protective material in the soft palate area does not actually offer the much-needed protection but only increases the discomfort and weight of the mouthguard. Additionally, a proper cut adjusts the thickness in specific areas, and this helps streamline the mouthguard as much as possible. While it’s recommended that you maintain proper thickness for protection, anything more than that is discouraged, since it can lead to uncomfortable gagging. NATA’s statement mentions that it’s important for athletic trainers to be familiar with contemporary mouthguard designs. They should also have some knowledge on the materials used to make these mouthguards as well as the variables incorporated into the material. The statement is categorical about mouthguard materials and only recommends the ones that have been approved by the US Food and Drug Administration; have adequate thickness all through; and are fabricated over a stone model from an impression. 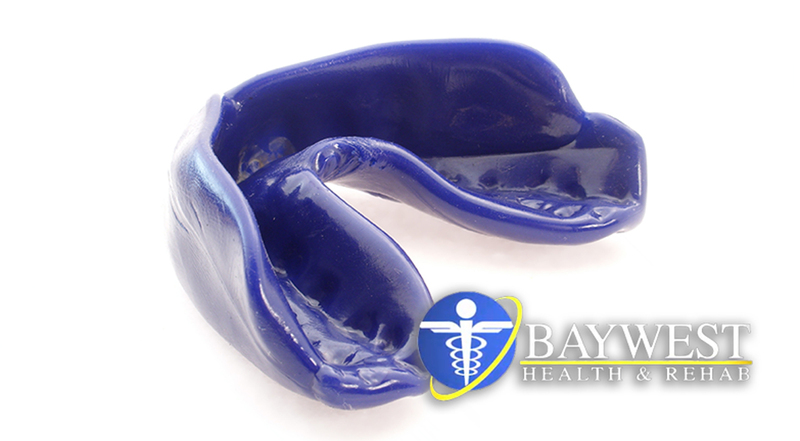 NATA further states that most athletes wear non-compliant mouthguards, which include the boil-and-bite types. We still don’t have national standards for protection, but NATA advises that athletic trainers should consider materials that are at least 4mm thick in the important impact zones, which are the areas in front of teeth and under molars. That means unnecessary materials that add bulk will not be there. Nevertheless, important zones vary depending on the sport. Take for example contact sports like ice hockey and football, where the shield or facemask protects the frontal impact. In this case, your mouthguard is likely to have a thinner frontal profile but with more protection under the molars. Combat sports, such as boxing or MMA, mostly involve deliberate and frequent impacts to the mouth and face; hence, the recommended mouthguard is that one with a more protective frontal profile. Generally, a mouthguard material should be easy to manipulate, tasteless & odorless, tough enough to resist cutting by biting, resistant to damage from water absorption, hot water, and low pH, rigid enough to distribute forces over a large surface area of teeth, as well as impact-resistant. The material should also have the ability to withstand normal cleaning compounds, as well as have sufficient elastic modulus to help reduce stress beneath material in case of impact. According to NATA, mouthguards should be cleaned with a mild antimicrobial agent, and then rinsed thoroughly in water before and after use. However, studies have proven that an effervescent cleaner or denture cleaner works best in cleaning a mouthguard, and it’s highly recommended. NATA also suggest that athletes should make sure their mouthguards are kept in a clean, ventilated, and rigid plastic container. Additionally, they should be keen enough not to expose their mouthguards to prolonged direct sunlight/sources of heat. They are also advised to routinely examine their mouthguards for fit and for any damage.